Hey, ace of cakes: what’s your favorite recipe? cake blog? I bake plenty of bread, but cake? Not so much. With exception to the one above and tiramisu (a recipe “stolen” from my old boss Saleh Joudeh, which isn’t baked at all but also includes mascarpone), I don’t do cakes. I don’t even eat them much. Apparently, I’m in the minority. Everyone, it seems, loves cakes and their sweet little siblings, cupcakes (have you checked out Seattle’s own CakeSpy, or the hilarious Cake Wrecks blog that had all my pals slapping their knees after they read this recent story in the NYT). Perhaps the Food Network show “Ace of Cakes” is fueling their appetite (Nate’s addicted). 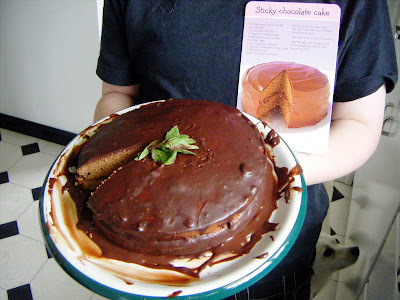 Nate’s “Sticky Chocolate Cake.” Got milk? Well, after I told you about 17-year-old baker Elissa Bernstein and her glorious cakes yesterday, a colleague sent me this kick-in-the-pants column by Petula Dvorak at the Washington Post, whose tale of obsessive cake-decorating involves her search for a way to create the perfect suction cup for an octopus cake — heaven help her. Petula writes that her sweet obsession has her husband rolling his eyes — in vain. “You might want to start thinking about what it is that people say about you when you leave a room,” he told her in the wee small hours of the morning after finding her, hacksaw in hand, attempting to make the internal structure for a rocketship cake. She also introduces us to some like-minded individuals whose extreme cakes make my best efforts look like something Betty Crocker might whip up in a Jiffy for her friend Duncan Hines. I’ve always said that someday, when I have worlds of time, I’m going to expand my baking repertoire, learn to make perfect buttercream rosettes and other pretties so I can wow friends and family with elegant layer cakes — perfect for birthdays and other special occasions. And when I do, I expect to turn to my stack of cake bibles and the Web in search of inspiration. 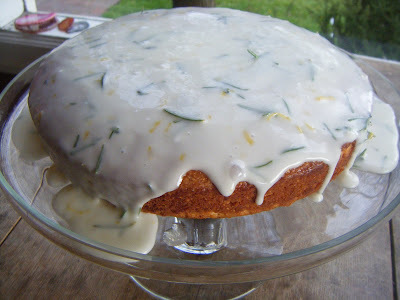 Which leaves me wondering: What’s your favorite cake recipe? Extra brownie points (so to speak) for a link to it. Are you a fan of cake blogs? Turn me on to the ones you like, too. Believe me: I could use a few tips. 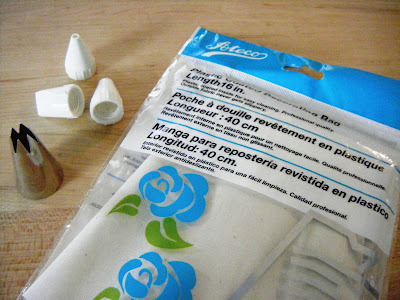 My pastry bag and decorating tips, so far unused.